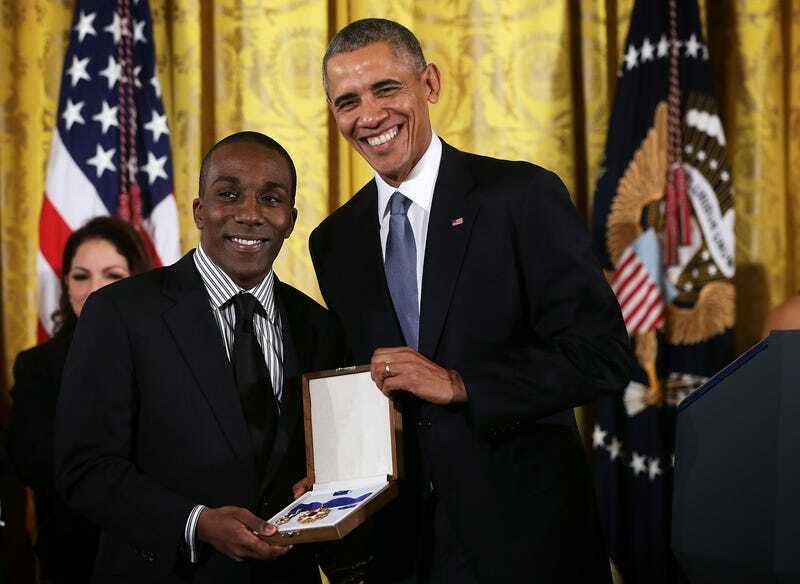 Andre Dubois, grandnephew of former U.S. Rep. Shirley Chisholm (D-N.Y.), receives the Presidential Medal of Freedom on behalf of the late congresswoman from President Barack Obama during an East Room ceremony at the White House in Washington, D.C., on Nov. 24, 2015. President Barack Obama named 21 recipients of the Presidential Medal of Freedom, the highest civilian honor in the nation, on Wednesday, according to a White House press release. The 21 honorees this year are social-justice advocate and retired NBA All-star Kareem Abdul-Jabbar, Native American advocate Elouise Cobell, comedian and talk show host Ellen DeGeneres, actor Robert De Niro, polymath physicist Richard Garwin, philanthropists Bill and Melinda Gates, architect Frank Gehry, mathematician and computer scientist Margaret H. Hamilton, actor and filmmaker Tom Hanks, Rear Adm. Grace Hopper, retired NBA All-Star Michael Jordan, artist and designer Maya Lin, Saturday Night Live producer Lorne Michaels, attorney Newt Minow, Miami Dade College President Eduardo Padrón, actor and environmentalist Robert Redford, entertainment icon Diana Ross, broadcaster Vin Scully, singer Bruce Springsteen and actress Cicely Tyson. The Nov. 22 ceremony will be live-streamed at whitehouse.gov/live.